IMPROVE YOUR MOBILITY WITH THE FAST PAIN RELIEF YOU NEED Our compression foot sleeves provide instant relief to your arch and heel through compression support that provides the maximum boost to your blood circulation. Better oxygen circulation helps reduce lactic acid build up and aids muscle recovery in ankle and feet, including your heel and arch. Why let yourself suffer any longer? 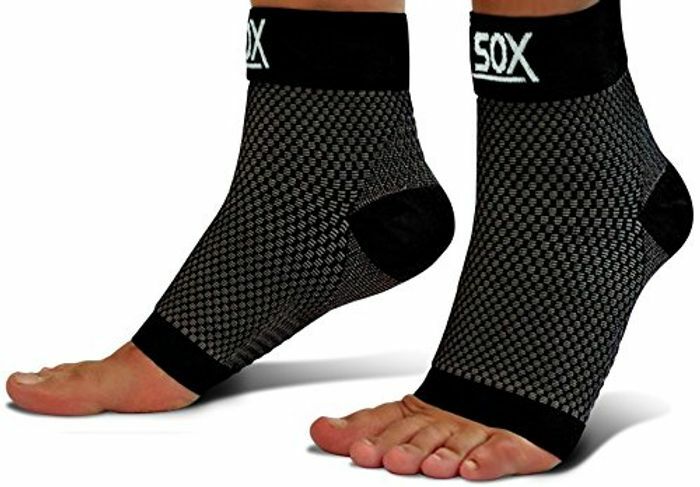 Walk freely with our compression foot sleeves and perform physical activity pain free again! RECOMMENDED DESIGN Our medical grade, FDA-registered compression foot sleeves are recommended by doctors and preferred by trainers. The targeted ribbing arch support provides unmatched comfort and pain relief for your feet. We carefully designed and manufactured our compression foot sleeves to provide premium support, comfort, and relief without compromising your mobility. Form fitting, lightweight, and breathable fabric features maintain joint stability regardless of activity. THE BEST FIT AND COMFORT, IDEAL FOR DAILY WEAR Available in 4 different sizes to ensure you receive the focused support that you need. Wear with sandals, shoes, boot with insoles, slippers, and under any socks. Designed with lightweight, durable, and breathable fabric especially great if you are on your feet for long periods of time. The anti-odor and anti-static fabric stops the growth of bacteria and fungus, while wicking moisture/sweat away from your feet keeping you dry! GREAT INVESTMENT FOR YOUR FEET (GREAT GIFT IDEA TOO!) We spend so much time on our feet yet tend to neglect our feet. Why settle for anything less than fast pain relief at a great value? And while you are at it, grab a few pairs for your family, friends, or loved ones as a gift that is functional and beneficial to their health! Also, a great gift to runners, athletes, fitness workouts, hiking, tennis, cycling, office workers, airplane travelers, or anyone on their feet all day!